One of my favorite haunts. I visit frequently but have never been there at night. I'm a regular at lunch time and try to delay until two PM to take advantage of their Hoppy Hour specials. Service has always been excellent as is the food. I would match their clam chowder against any in the country. Fabulous! Fish and chips are one of their most popular dishes and also great. I'm an IPA fan and can always depend on their Gale Force IPA. Their seasonal brews are worth a try. I've been really pleased by their Mai bach but was disappointed by some of their other seasonal selections. Probably just a personal taste thing. 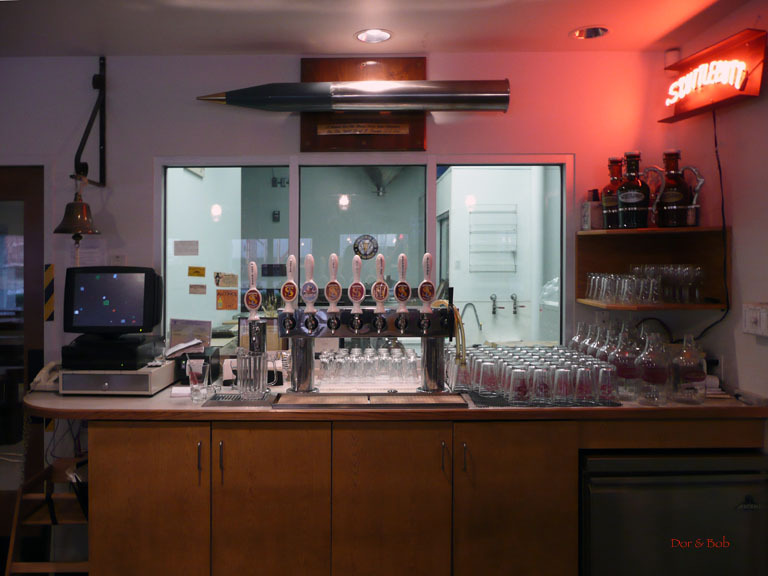 Parking is very adequate, atmosphere is family friendly but also a good place for the guys to hang out and dwell over beer. Not fancy. They've announced that they are moving to a new place a few blocks from their current location. Hope they don't spoil it. I stop at Scuttlebutt just about every time I pass through Everett. There beer is not my favorite, but they are generally very good. And I've purchased several kegs and they are always excellent. I think they may need to clean the lines in their taproom a little more often as I've noticed some of their beers on tap don't taste nearly as good/fresh as I've had from the kegs I've purchased. I appreciate their selection and they usually have at least 1-2 seasonals or something new. The food is great. Typical bar food, but everything is good. I really like their fish and chips and brats. Never had anything I have not liked. Service is very good, we are usually greeted and seated within seconds of walking in and well attended to. They recently added on a new room that is much nicer than the old seating area. Great room for a large group. I like the merchandise they have as well! Overall I highly recommend this place as a lunch stop or even dinner. Or just pop in for a quick beer! 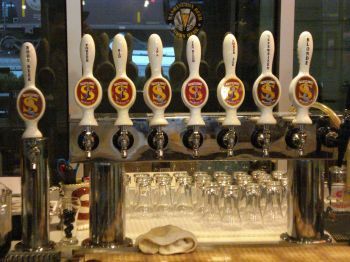 Scuttlebutt is very consistent in making good beers and the food and service are above average. All of this is evident by the fact that it is generaly pretty busy. The Gale Force IPA is quite good. The atmosphere is a bit lacking. They benefit from being located right on the water and adjacent to a very large and active port and marina. 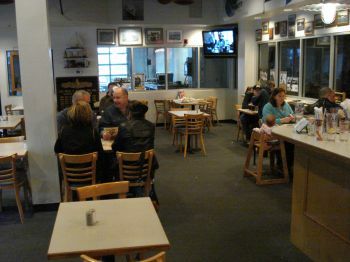 But it is more of a restaurant than it is a bar or taproom - there is no bar seating - just tables. It is also a little bright inside. While it is not the type of place that you settle into for a long Friday or Saturday night, these attributes make it more family friendly and great for lunch and dinner. 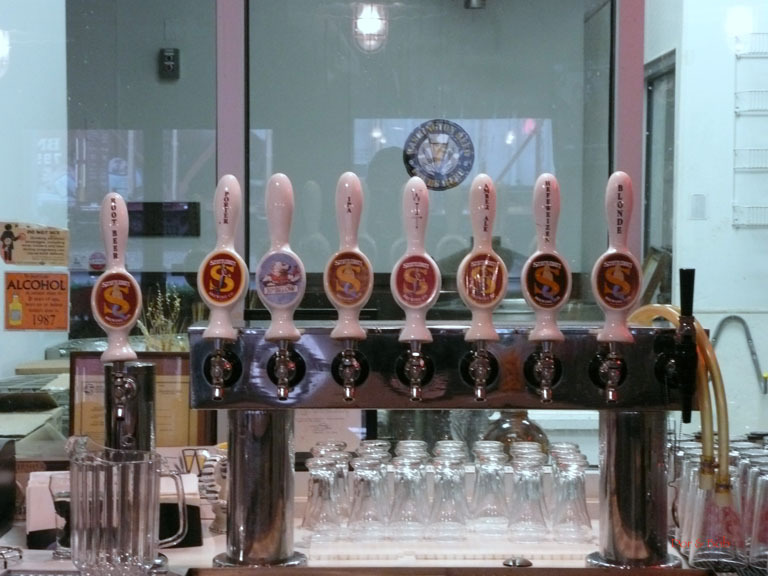 Well, we visited Scuttlebutt this last Thursday during "Hoppy Hour" which runs 2-6 PM Monday through Friday. $2 pints and 1/2 off appetizers made the trip very worthwhile. While some of us enjoyed the Gale Force IPA and a couple had the Amber, I had a couple of pints of the Mai Bock, their current seasonal and found it absolutely delicious. Other reviewers have sung their praises so I won't duplicate except to say the beer is very well done and consistent. About the food though, we had the appetizers. The onion Rings were very good, the jalepeno buttons (sliced jalepenos breaded and deep fryed) were fabulous and the house fries were very good. Needless to say we cleaned the plate, and I'm still raving about the jalepeno buttons as well as the Mai Bock. 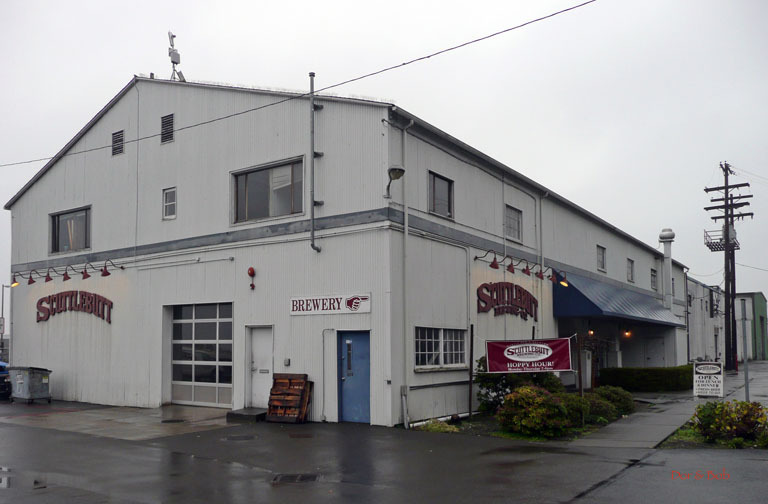 In a semi-industrial, or at least working port, area right on Puget Sound, across the street from multiple railroad tracks filled with freight trains, Scuttlebutt is not a fancy brewpub in a popular area of town. 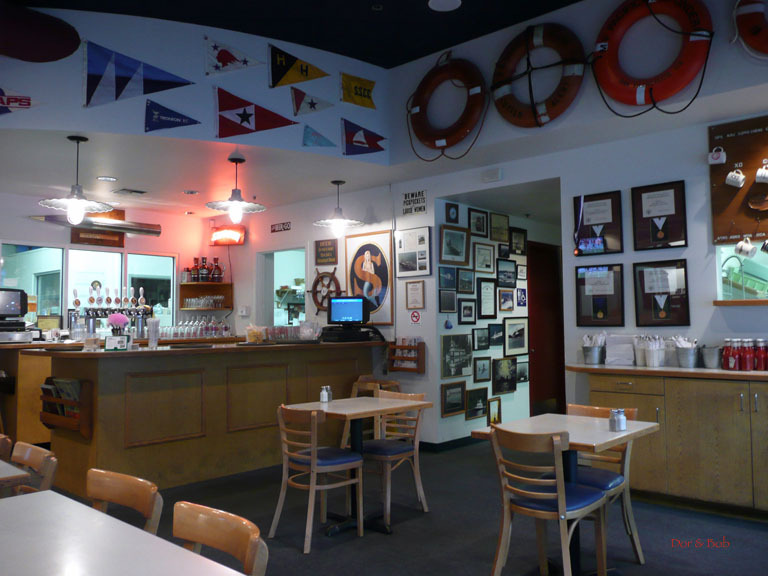 But itâ€™s very clean with bright white walls with nautical decor (life preservers, hockey jerseys and sticks, naval battle awards) and light wooden padded chairs, and formica topped tables. Three shellacked wooden picnic tables on a covered concrete slab are in front overlooking the street and the railroad cars. The feeling is comfortable and friendly. The clientele ranges from office workers to industrial workers and retirees. The bar is light wood and there are no stools in front. The bar back is windows looking onto the room behind. Scuttlebutt - the Random House Dictionary says it's a word for rumor or gossip...but it's really a nautical term for the drinking station on a boat and therefore, the place were things were discussed. So it's the perfect name for a brewpub now, isn't it? And this Scuttlebutt sits right on the wharf in Everett and is full of watery features, from the large bullet ("round") over the bar the numerous flags & pictures of ships that line the walls. Typical pub food here - nothing out of the nautical ordinary although they do serve up a good hummus plate and turkey burger. Tell the cook to "drop" the fries twice & they'll come out perfect: crispy outside, doughy inside. Then you can match your food w/several types of beer including a very good Hefe @ 4.7%ABV, a Homeport Blond, Amber ale, Sequoia Red, Gale Force IPA, delicious Nut Brown Ale (not always available unfortunately) and wife Persimmon's & my favorite; the black-as-licorice Porter (@ 5.8%ABV) w/subtle coffee taste & aroma that first warns you "Don't be afraid of the dark." No indeed. This beer pours thick & rich and fills the mouth with pure brew delights. Although the others we found lacking in character. Avast ye scurvy bilge-rats! Be ye friend or foe, know ye true that any Scuttlebutt ye might overhear can be drowned in the devil's brew. Aaarrrrhh.